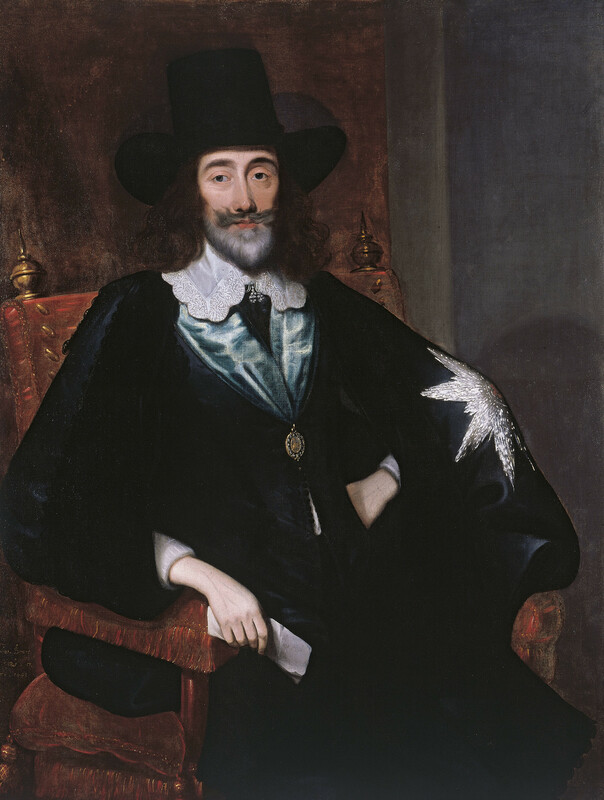 Charles I is here depicted in the last month of his life, facing the charges brought against him by the Parliamentarians. Following his defeat in the Civil War he was brought to trial before the High Court of Justice in the Great Hall at the Palace of Westminster in January 1649. The king's first appearance was on 20 January, when he was received by the Sergeant-at-Arms, 'having a crimson Velvet Chair set before him. After a stern looking upon the Court and the People in the Galleries on each side of him, he places himself in the Chair, not at all moving his Hat, or otherwise shewing the least respect to the Court'. The king was accused of being 'a tyrant, traitor, murderer, and a public and implacable enemy to the Commonwealth of England'.2 He refused to co-operate, enter a plea or acknowledge the legitimacy of the court. He was found guilty and was executed on 30 January in front of the Banqueting House at Whitehall Palace. It is likely that the artist, Edward Bower, made a number of drawings inside Westminster Hall, which were later worked up into oil portraits in his studio at Temple Bar. There are two other important signed and dated versions which show the sitter holding a silver-headed cane as well as the sheet of paper. Perhaps surprisingly the artist was probably commissioned by Charles I's opponents - one of the other versions is traditionally stated to have been painted for John Carew, a signatory to the King's death warrant. Despite this, the sitter has not been depicted unsympathetically and the resulting portrait conveys something of the sense of dignity maintained by the fallen monarch, who by this stage had been imprisoned in Carisbrooke Castle on the Isle of Wight for fourteen months. Bower was amongst those appointed to ride in attendance on Charles II when he made his entry into the city shortly after the Restoration of the monarchy in 1660.